Love to check out the threads on the board, now finally decided to make an account in the hope some of you could help me out. Kneed, work, the dough for about 5 minutes. Pic 1: 'rough' sheet after rolling at medium thickness. I trim the edges after so that it's a nice square. Pic 2: I feed it through the pasta machine. The spaghetti is coming out but with a 'fleece' in between. It's not easy to pull apart manually, it destroys the spaghetti strings. Pic3: The alignment of the rollers in my pasta maker. At least I don't see them being misaligned too much, are they? Love to hear if you have advice! I make a lot of pasta; I can tell by looking that your dough is just too moist to cut. Take the water out and just incorporate the egg in the dough more slowly, allow it to become a 'shaggy mess' while you mix it - don't add more moisture, just keep kneading, it'll hydrate evenly and turn into a well-behaved ball. I'm guessing you got to the 'mess' part and added more liquid, that was probably your mistake. 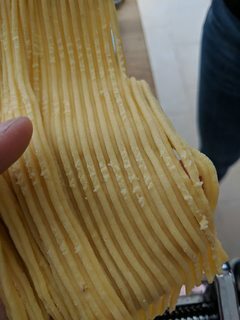 I'd also cut spaghetti on the #5 setting on your pasta machine (it looks like you did #4, but that could just be due to the dough looking 'sticky' and a little thicker than you rolled it). Don't give up! If you want a reference for a 'semi-foolproof' dough, I put mine on Github so it could be useful. While mine is based on fine 00 milled standard flour, it would work equally well for durum with a little adjusting, and It describes the kneading and working in (way more) detail than would be appropriate to post. Also, consider starting with simple 00 (double-awt) milled flour, or even AP flour so you get a feel for the dough, then tougher flours like durum / wheat / etc. Just get quality flour. Adding oil is only going to moisten the dough and make it stickier. The key is to sprinkle the dough with a dusting of flour just before passing it through. The cutters themselves might have a build up of oil and moisture now. Be sure to dry it out if you can. As other comments suggest, more flour is going to be needed to reduce the stickiness. There are several ways to do this. You might try making the original dough with 110 g of flour instead of 100, which would lower the moisture content of the entire dough (Or you could use a smaller size egg with 100 g of flour). Other comments suggest dusting the dough with more flour as you run it through the rollers, which will also help. The dusting will add smaller amounts of flour. Which works best is going to be up to you to experiment. Looking at your pictures, it appears that the dough is significantly sticky. I would try the additional flour in the original dough approach, particularly if you are in a humid climate. You can always dust the dough with more flour as you roll it, either way. I agree that your pasta is too wet still to put it through the cutter section. Don't give up, though. Making pasta is really easy once you get the hang of it, and it's delicious. This won't work because your pasta is still going to be too wet. The dough will dry on the surface, but when you put it through the roller or cutter, the 'inside' of the sheet will still be sticky. You can make great pasta with just flour and water. The trick is getting it to the right elasticity and dryness/moisture level. For many years I made all our pasta, and learned some tricks. I hope they help. Hand kneading was time consuming and made my hands ache (arthritis), while kneading with the pasta machine was much easier on my hands and improved the pasta's elasticity tremendously. I stopped rolling it out at all (though I had the most wonderful roller... which I used then to drape my pasta over.) This was my method. After incorporating the ingredients and letting the pasta rest, I cut it into a few pieces (and cover.) Set the machine up and flour your surface heavily. With the machine at the widest setting, take a piece of dough, flour it both sides, and pass it through. At first, it will hold on to a fair amount of flour and you will have a (very long) somewhat sticky sheet. Cut it into manageable lengths and set aside (covered with a clean cloth) the other pieces while you work with the first. Dust both sides, fold, and put it through the widest setting again. Repeat several times, being sure to dust each time. When your pasta has incorporated some flour, it will start to feel drier. 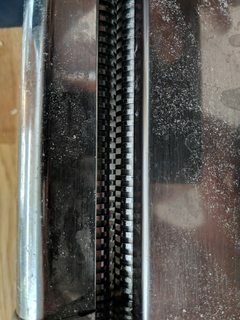 When that happens, start setting the rollers closer together and roll your pasta, still dusting, but the drier it gets, the less dusting it will need. Roll to the desired thickness (you can make anything from lasagna to very thin.) Your pasta will hold itself together very well (no little ragged edges.) 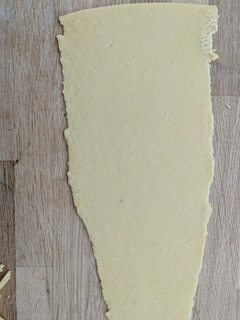 If you want to save pasta, don't cut the uneven edges, just fold the edges over onto the sheet to meet in the middle and roll through again twice. You can use any kind of flour (it will taste and behave differently with different flours) but any decent flour will do, and it can be as thin or thick as you like. The sauce you're using or your preference should determine the thickness, not the dough. Good luck! It's definitely worth it! Oat Flour for pasta not rolling well? Extrusion pasta maker versus roller: which one makes the best pasta?